The show includes 10 metal works created using Urdu calligraphy and two works on paper, in which Chishtee reflects upon his memories of a traumatic childhood post partition and political unjust of the newly found country, albeit in a language that is both poetic and aesthetic. 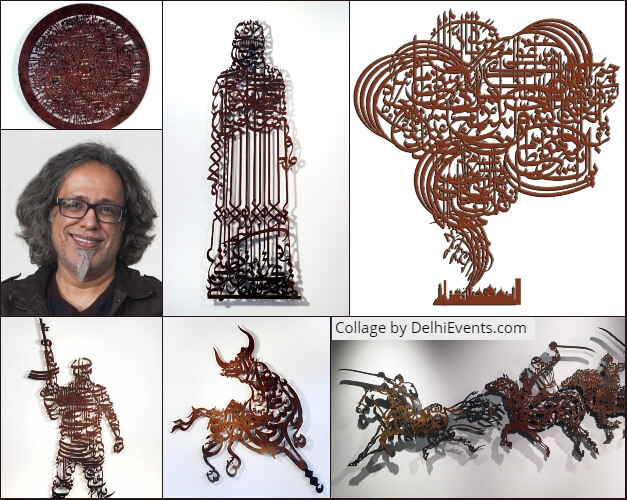 Chishtee,­ a figurative sculptor from Lahore, Pakistan, encourages his audience a twofold experience: deciphering the work from the perspective of visual neutrality while also suggesting the importance of understanding the text. Chishtee’s works are an effort to disjoin from the personal horrors of his inner conflict regarding identity and conditioning. His installations, sculptures and site-specific works have been exhibited internationally at various locations, including the 56th Venice Biennale. “This desire and obsession to conquer, win, and control has led to universal destruction in every war. These wars have led to the loss of innocent lives, escalated egos, personal struggles between good and evil, lies, religious exploitations and mostly outer and inner instability,” says Chishtee. Born in Lahore, Pakistan, Chishtee (1964) is a visual artist based in New York City. Chishtee holds a MA in studio arts from Sac State, Sacramento, CA. Before moving to States he taught at National College of Arts, Lahore, Pakistan, for ten years. Besides exhibiting his work, Chishtee had done public commissions in major cities of Pakistan, One of his commissions in NYC includes transforming a 150 apartments residential building in Brooklyn into his art installation. As a child, Chishtee learned the art of calligraphy from maestro painter Sadeqain in Lahore. Sadeqain’s masterly done non-traditional calligraphic paintings seems all figures to him, for young Chishtee these were dancing or acrobatic movements of a human body all over his canvases, analogous with that Chishtee instead of using Urdu or Arabic letters, chose figures to narrate his stories.